Welcome spring or show off your lucky side with crocheted shamrocks or four-leaf clovers. This pattern can easily be completed in less than 20 minutes by a beginner using simple crochet stitches. Use this pattern to create both shamrocks and four-leaf clovers for any occasion. The instructions given are for a shamrock (three leaves). If a four-leaf clover is desired, add a ch loop to Rnd 1 and repeat between the ** in Rnd 2 three times. Size: approximately 2 1/2" in diameter. Pull the yarn tail to tighten the center of the magic ring. Leave a hole in the center of the magic ring large enough to insert the crochet hook. Rnd 2: Working in the first chain loop, *2 sc, 2 hdc, 2 dc, 2 sc, 2 dc, 2 hdc, 2 sc. Sl st into the center of the magic ring. * This forms the first leaf of the shamrock. Repeat between the ** in the remaining 2 chain loops. Do not fasten off. Stem: Ch 8. Dc in the 3rd ch from the hook and in the next ch, hdc in the next ch, sc in the next, sl st in the two remaining chs, sl st in the center of the magic ring. Pull the tail to finish closing the center of the ring. Fasten off and weave in the ends. If you prefer to have a hard copy of this pattern, click on the image below to download it in a free, printable PDF file. Click to download this pattern. Quite often a shamrock and a four-leaf clover are considered the same, but they are not. A shamrock is the symbol for Ireland. It has three leaves. St. Patrick used the leaves of the shamrock to explain the Holy Trinity. Clovers with four leaves are much more rare and are considered lucky. Somewhere along the way the four-leaf clover has become as much a St. Patrick's Day symbol as the shamrock, at least outside of Ireland. Create holiday or seasonal decor with these small crocheted shamrocks, or spruce up your spring wardrobe with a touch of the green. Change the shade of green yarn used, or utilize neutral whites for variety in your finished clovers. Glue a bar pin to the back of a shamrock for a lapel pin. Even if your wardrobe is lacking in green, this little addition will ensure you won't get pinched on St. Patrick's Day. Crochet a chain between shamrocks to form a fashionable scarf. Thread a long ribbon through the tops of several shamrocks and hang as a banner across a mantel or cupboard top. Applique or stitch shamrocks or clovers to hats, purses or sweaters. Tie small ribbon loops to the tops of shamrocks, then bring in a small branch from your yard and hang the shamrock ornaments from the twigs of your indoor tree. 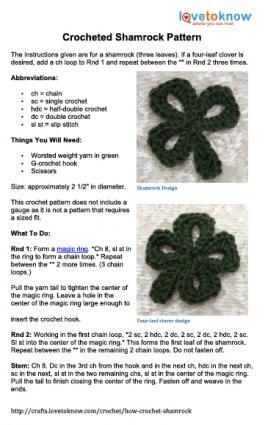 There are many patterns and designs available for crocheting a simple shamrock. Try one of these patterns for more ideas. Midwestern Moms has an adorable shamrock that is easy and super quick to complete. These would be wonderful made into pins and given out as favors at school parties. Sarah at Repeat Crafter Me has incorporated her crocheted heart pattern into a cute little shamrock for St. Patrick's Day decorating. This is an easy pattern that does require some assembly, but is still quick and easy. Crochet is often thought of as a cold weather craft, but in reality it is a fun past time anytime of the year. Keep a basket of yarn handy while watching a movie, or fill a tote bag for car trips and outdoor picnics. Projects like this one are quick and easy to make, and you'll have shamrocks to share in no time.